Lecoq L., Moula N., Amory H., Rollin F., Leroux A. Two-dimensional speckle tracking echocardiography in calves: feasibility and repeatability study // J Vet Cardiol. 2018 Feb;20(1):45-54. OBJECTIVES: To assess the feasibility and repeatability of two-dimensional speckle tracking echocardiography for the evaluation of left ventricular function in healthy calves. ANIMALS: 12 Holstein calves, 62 ± 11.6 days old; 75.25 ± 5.4 Kg. METHODS: Observational study. Right parasternal short-axis views at papillary muscle level were recorded in standing calves and subsequently analyzed by two-dimensional speckle tracking for global and regional radial and circumferential strains and strain rates and radial displacement. Echocardiographic examinations were performed by 2 observers to evaluate intra- and interobserver repeatability and variability. RESULTS: Two-dimensional speckle tracking was feasible in all calves. Automated tracking was better in systole than in diastole. Repeatability of the technique was good in calves. Systolic radial strain and strain rate peak values showed little variability compared with systolic circumferential strain and strain rate and to all diastolic measurements. Variability of the interobserver measurements was greater than the intraobserver measurements. CONCLUSIONS: Two-dimensional speckle tracking is feasible in calves. As in other species, evaluation of systolic radial left ventricular function is more reliable than circumferential and diastolic left ventricular function. Early diagnosis of cardiac diseases in the bovine species is difficult based on clinical signs only . However, early recognition of those patients might improve treatment outcome or avoid unnecessary costs associated with the treatment of an animal with a poor prognosis. Many cardiac diseases in cattle, and particularly in calves, directly affect the myocardium including primary dilated cardiomyopathy [2,3], cardiomyopathy secondary to bacterial or viral infections [4,5], vitamin E/Selenium deficiency , or intoxication with ionophore  or doxycycline [8—10]. Two-dimensional speckle tracking (2DST) echocardiography is an innovative technique that allows quantitative assessment of regional and global systolic left ventricle function based on a frame-by-frame tracking of acoustic speckles on two-dimensional grayscale conventional images [11,12]. The relative measurement of deformation of a myocardial segment is described by its strain (e.g. lengthening or shortening compare to its original size). The strain rate represents the speed at which this deformation occurs [13,14]. Both parameters provide complementary information and have been used to quantify the myocardial function in humans, dogs, cats, horses, and goats [13,15—22]. The goal of this study was to assess the feasibility and reliability of 2DST echocardiography for quantification of circumferential and radial strains and strain rates and displacement of the left ventricle in short-axis views at papillary muscle level in healthy calves. For this observational study, 12 Holstein lactated calves (6 males and 6 females; mean age: 62 ± 11.6 days; mean body weight: 75.25 ± 5.4 Kg) were used. Calves were deemed healthy based on history, general examinations, electrocardiography, and conventional as well as Doppler echocardiography. Speckle tracking was performed on all calves on day 1 and day 3 by a single operator (LL) to assess intraobserver repeatability. The 6 female calves (mean age: 66 ± 6 days; mean body weight: 76.6 ± 4 Kg) were also evaluated by a second operator (HA) on day 2 to assess interobserver repeatability. Before 2DST image acquisition, calves were handled for 2 days, and general examination, cardiac auscultation, electrocardiography and complete two-dimensional echocardiography, including M-mode, color and pulse wave Doppler echocardiography, were performed following the guidelines of the local animal care committee. Image acquisition was performed using a Vivid I ultrasound unitd with a 1.5—3.6 MHz phase-array transducere. The calves were standing and man¬ually restrained during the procedure. A modified base-apex electrocardiogram was recorded simul¬taneously. At least 4 cine-loops of right parasternal shot-axis views of the left ventricle were recorded in 2D mode at papillary muscle. Cine-loops covered 5 to 6 cardiac cycles with a frame rate ranging between 51.2 and 79.7. Two-dimensional speckle tracking measurements were performed offline and blindly by a single observer (LL) with a dedicated systemf,g in a semiautomated manner using the Q-analysis and 2D- Strain application of the software. After selection of a single cardiac cycle, RR interval was recorded, simultaneous heart rate was calculated, and the loop was frozen at the end of systole. A circular region of interest (ROI) was drawn manually fol¬lowing the inner margin of the endocardium, clockwise, starting at 12 o’clock at the level of the interventricularseptum. Papillary muscles were not included. Region of interest width was then adjusted to cover the entire myocardium. Speckle tracking started automatically as soon as this operation was done dividing the ROI into 6 seg¬ments, labeled according to human guidelines (septal: SEPT; anteroseptal: ANTSEPT; anterior: ANT; lateral: LAT; posterior: POST; inferior: INF; Fig. 1). Tracking of the ROI was visually assessed and approved by the operator or corrected if needed before moving to the next screen. Parameters measured were: circumferential and radial strains and strain rates and radial displacement. Graphical (curves) and numerical (peak values) results were displayed for each segment. Cursors determining peak values were manually adapted when needed for circumferential strain (SC), radial strain (SR), systolic, early and late diastolic circumferential strain rates (SrCS, SrCE, SrCA), radial strain rates (SrRS, SrRE, SrRA), and systolic radial displacement (DRS). The average of 3 non-consecutive cycles was used for the analyses. The region of interest is divided into 6 segments based on human nomenclature. ANT, anterior segment; ANTSEPT, anteroseptal segment; INF, inferior segment; LAT, lateral segment; POST, posterior segment; SEPT, septal segment; 2DST, two-dimensional speckle tracking. where SD is the standard deviation. Coefficient of variation were arbitrarily fixed as: CV < 15%, low variability; CV 15—25%, moderate variability; CV > 25%, high variability (20). Reference values were calculated as mean ± 2 standard deviations using pooled data of the 12 calves. d Vivid I, Software version 9.1.0, General Electric Healthcare Europe GMBH, Diegem, Belgium. e GE 3S-RS probe, General Electric Healthcare Europe GMBH, Diegem, Belgium. f EchoPAC 7 software version 108.1.5, General Electric Healthcare Europe GMBH, Diegem, Belgium. g SAS: Statistical Analysis System, Version 8, SAS Institute Inc., Cary, NC, USA. Results of two-dimensional measurements of the left ventricle are presented in Table 1 and are similar to previously published values . Two-dimensional speckle tracking analyses were feasible in all calves at all times. Mean heart rate during echocardiography was 83 ± 10 bpm (60-106 bpm). Automated tracking by the software was generally confirmed visually by the operator. Manual correction was necessary in 31/180 segments (14 LAT, 12 POST, and 5 INF) because of poor tracking quality at the end of diastole although tracking appeared sufficient during the remaining of the cycle. Therefore, these segments were included in the analysis, and all myocardial segments in all calves were used for the study. Cursors could reliably be placed on all peaks . The curves for each variable are presented in Fig. 2. As described in other species [12,18,20-22], all segments of the myocardium showed a positive inflexion for SR, SrRS, SrCE, SrCA, and DR, whereas negative inflexions were observed for SC, SrCS, SrRE, and SrRA. In all calves, peak radial strain for all segments occurred after aortic valve closure (Fig. 2B), a phenomenon called postsystolic thickening. Intraobserver repeatability was good for all peak values except SEPT SC (p=0.0145). An interobserver effect was observed in 4/91 peak values (SEPT SC and SrCE, INF SrCA and LAT DRS; all p<0.05). Peak values, intra- and interobserver variability are presented in Table 2. Graphical representations of intra- and interobserver variability of pooled global and segmental peak values for SR, SC, SrR, SrC, and DR are presented in Figs. 3 and 4, respectively. Intraobserver variability was low to moder¬ate for most systolic global and segmental peak values. Radial strain (SR) and SrRS showed little variability compared with SC and SrCS and to all diastolic measurements. Measurements of ANT- SEPT, SEPT, and ANT segments as well as global measurements were the least variable. Interobserver variability was consistently higher than intraobserver variability. Table 1 Two-dimensional echocardiographic meas¬urements of the left ventricle of the 12 healthy calves used for the 2DST study. Abbreviations: Ao, aortic diameter at the sinus level; d, measurement in diastole; FS, shortening fraction; IVS, interventricular septum; LAD, left atrium diameter; LVFW, left ventricular free wall; LVID, left ventricular internal diameter; s, measurement in systole; SD, standard deviation; 2DST, two-dimensional speckle tracking. Top left: grayscale short-axis image at papillary muscles level with region of interest. Bottom left: parametric color-coded M-mode. Right: segmental traces, peak values indicated on the curves are tabulated below. (A) Circumferential strain (%); (B) radial strain (%), note that peak radial strains of all segments appear after aortic valve closure (AVC), a phenomenon called post-systolic thickening; (C) circumferential strain rate (1/s); (D) radial strain rate (1/s); (E) radial displacement (mm). and quantify systolic and, to a lesser extent, dia¬stolic left ventricle function of calves of this age with good intra- and interobserver agreements. 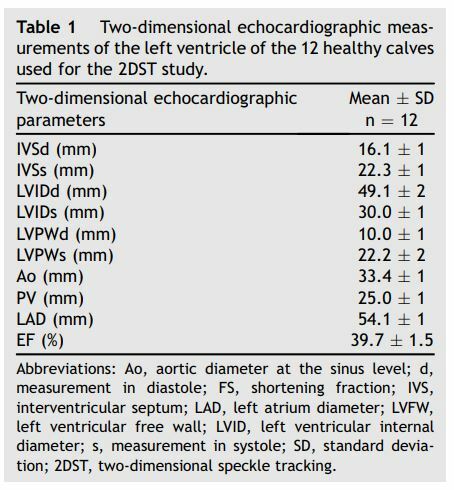 Table 2 Mean ± SD values and mean intraobserver and interobserver variability of global and segmental peak values of 2DST measurements of left ventricular function at papillary muscle level in healthy calves. Two-dimensional speckle tracking echocardiography is a non-invasive technique used to assess myocardial deformation and displacement of the left ventricle . Although it has been validated in several species, this had never been done in cattle [12,18,20—22,24]. Many cardiac diseases affect the myocardium in calves and when performed, evaluation of left ventricle function is usually done by conventional two-dimensional echocardiography, M-mode, or flow Doppler methods [23,25—28]. Several limitations can be outlined for these methods. Visual appreciation of the left ventricle in two-dimensional images or cine-loops is subjective, fractional shortening calculated in M-mode rely only on measurements over a narrow area obtained from a three-dimensional structure and therefore lacks accuracy to detect regional wall motion abnormalities, whereas Doppler echocardiography is angle dependent . Two-dimensional speckle tracking relies on frame-byframe tracking of acoustic speckles on 2D images. It is angle and load independent and allows objective evaluation of regional wall motion and deformation [11,12,24,30,31]. Although it requires a high frame resolution and good two-dimensional image quality, this was not difficult to achieve in calves of that age. Each variable presented a repeatable curve pattern. The SR and SrR curves were the most reproducible. Curves for strain, strain rates, and displacement were similar to those obtained in other species such as dogs, horses, and goats [20—22]. Large differences between segments were observed for the SC with lower peak values reported in the left ventricle free wall segments (LAT and POST). Similar variations were observed in horses  and goats . This is probably due to a decrease of lateral resolution when deeper structures are imaged with a curvilinear/phase- array probe (divergence of the ultrasound beams at higher depth) . Measurement divergences between species can be affected by many factors but keeping that in mind, peak values obtained for calves are similar to values obtained for goats , while absolute values of systolic and diastolic SrC and SrR are generally higher in calves than in horses [18,20]. This larger circumferential wall deformation could be due to the faster resting HR in calves compared with horses while the percentage of deformation remains the same but studies in dogs did not show significant modifications of 2DST parameters with increasing heart rate [33,34]. On the other hand, absolute values of DRS are smaller in calves than in horses [18,20]. This could be explained by the relatively smaller thorax of calves compared with horses. Post-systolic thickening is defined as myocardial thickening occurring after aortic valve closure, during the isovolumic relaxation phase of the diastole. It was observed for all segmental peak values of SR in all calves evaluated in this study. It is usually observed in ischemic myocardial diseases but has also been observed in healthy animals [35—37]. As we did not have any evidence of cardiac impairment of the calves involved prior and throughout the study period, we considered it normal in our population. Figure 3 Graphical representation of intraobserver variability of 2DST segmental peak values (horizontal axis) obtained in 12 healthy calves evaluated on day 1 and day 3 by the same observer. Coefficient of variation are displayed on the vertical axis (CV < 15%, low variability; CV 15—25%, moderate variability; CV > 25%, high variability). Global and segmental values are represented by different symbols. A, measurement in diastole during atrial contraction; ANT, anterior segment; ANTSEPT, anteroseptal segment; DR, radial displacement; E, measurement in diastole during passive filling; INF, inferior segment; LAT, lateral segment; POST, posterior segment; S, measurement in systole; SC, circumferential strain; SEPT, septal segment; SR, radial strain; SrC, circumferential strain rate; SrR, radial strain rate. As in other studies, CVs were used as a measure of the relative spread of the data to assess variability and thus reliability of inter- and intraobserver two-dimensional speckle tracking (2DST) measurements. Several factors can affect the repeatability and variability of an examination: animal behavior, physiologic variations, environmental factors, technical considerations (transducer placement, machine settings, ultrasound machine, two-dimensional speckle tracking (2DST) measurements modalities) [20,38]. To minimize the sources of variability, examinations were performed at the barn in a quiet environment, and calves were accustomed to the procedure before starting the study. Operators used the same high-quality ultrasound equipment with standardized settings. Two-dimensional images were recorded and stored for further analyses, and all measurements were performed over a short period of time by one reader. Several measurements obtained for the evaluation of the systolic left ventricle wall function, especially SR and SrR, showed good intraobserver and acceptable interobserver variability, encouraging their use in a clinical setting in further studies. Interobserver measurements showed a lot more variability than intraobserver measurements which was also reported in other species [20,39]. This could probably be explained by slightly dif¬ferent techniques of image acquisition between the observers and day-to-day alterations of the behavior or environment of the calves. Inter- and intraobserver variabilities were assessed on sepa¬rate days. It is probably not ideal to minimize biological variability and environmental factors but is more representative to what happens in a clinical setting where several examinations are repeated on successive days and not always by the same clinician. True alteration of the parameters due to disease or treatment should be larger than the day-to-day variability observed when the same equipment, environment, operator’s experience and image acquisition protocols are used. Many cardiac diseases in calves affect the myocardium, and some can occur as outbreaks such as doxycy- cline intoxications, or cardiomyopathies due to selenium deficiency [8,10,40,41]. Most of the time those pathologies are discovered late in the course of the disease process when clinical signs of cardiac failure are already obvious and cardiac impairment is easily assessed with two¬dimensional echocardiography. In humans and horses, two-dimensional speckle tracking (2DST) was useful in the early detection of left ventricle impairment [16,42,43]. In calves too, it could help detecting ventricular pathologies earlier to decide to treat or cull those animals. A clinical trial should be the next step to evaluate if this is possible in calves. Figure 4 Graphical representation of interobserver variability of two-dimensional speckle tracking (2DST) segmental peak values (horizontal axis) obtained in 6 healthy calves evaluated on day 1 by observer 1 and day 2 by observer 2. Coefficients of variation are displayed on the vertical axis (CV < 15%, low variability; CV 15—25%, moderate variability; CV > 25%, high variability). Global and segmental values are represented by different symbols. A, measurement in diastole during atrial con¬traction; ANT, anterior segment; ANTSEPT, anteroseptal segment; DR, radial displacement; E, measurement in diastole during passive filling; INF, inferior segment; LAT, lateral segment; POST, posterior segment; S, measurement in systole; SC, circumferential strain; SEPT, septal segment; SR, radial strain; SrC, circumferential strain rate; SrR, radial strain rate. Short-axis two-dimensional speckle tracking (2DST) echocardiography is a feasible and reliable technique. It can be used to evaluate and quantify systolic and to a lesser extent, diastolic left ventricle function in calves with good intra- and interobserver agreements for most global and systolic measurements. Peak values can easily be identified. Radial curves (strain and strain rates) are highly reproducible and as in other species, radial strain and strain rates measurements are less variable than circumferential strain and strain rates. Buczinski S, Francoz D, Fecteau G, Difruscia R. A study of heart diseases without clinical signs of heart failure in 47 cattle. Can Vet J 2010 Nov;51:1239—46. Nart P, Thompson H, Barrett DC, Armstrong SC, McPhaden AR. Clinical and pathological features of dilated cardiomyopathy in Holstein-Friesian cattle. Vet Rec 2004 Sep 18;155:355—61. Brihoum M, Rollin F, Amory H. Les cardiomyopathies dans l'espece bovine. Ann Med Vet 2009;153:156—63. Haines DM, Moline KM, Sargent RA, Campbell JR, Myers DJ, Doig PA. Immunohistochemical study of Hemophilus som- nus, Mycoplasma bovis, Mannheimia hemolytica, and bovine viral diarrhea virus in death losses due to myocarditis in feedlot cattle. Can Vet J 2004 Mar;45:231—4. Karapinar T, Dabak DO, Kuloglu T, Bulut H. High cardiac troponin I plasma concentration in a calf with myocarditis. Can Vet J 2010 Apr;51:397-9. Orr JP, Blakley BR. Investigation of the selenium status of aborted calves with cardiac failure and myocardial necrosis. J Vet Diagn Invest 1997 Apr;9:172-9. Van Vleet JF, Amstutz HE, Weirich WE, Rebar AH, Ferrans VJ. Clinical, clinicopathologic, and pathologic alterations in acute monensin toxicosis in cattle. Am J Vet Res 1983 Nov;44:2133-44. Brihoum M, Amory H, Desmecht D, Cassart D, Deleuze S, Rollin F. Descriptive study of 32 cases of doxycycline- overdosed calves. J Vet Intern Med 2010 Sep-Oct;24: 1203-10. Zeeuwen AA, van Exsel AC, Jaartsveld FH, Wentink GH. Doxycycline poisoning in veal calves. Tijdschr Dier- geneeskd 1993 Dec 15;118:803. Yeruham I, Perl S, Sharony D, Vishinisky Y. Doxycycline toxicity in calves in two feedlots. J Vet Med B Infect Dis Vet Public Health 2002 Oct;49:406-8. D'Hooge J, Bijnens B, Thoen J, Van de Werf F, Sutherland GR, Suetens P. Echocardiographic strain and strain-rate imaging: a new tool to study regional myocardial function. IEEE Trans Med Imaging 2002 Sep;21:1022-30. Becker M, Bilke E, Kuhl H, Katoh M, Kramann R, Franke A, Bucker A, Hanrath P, Hoffmann R. Analysis of myocardial deformation based on pixel tracking in two dimensional echocardiographic images enables quantitative assessment of regional left ventricular function. Heart 2006 Aug;92:1102-8. Geyer H, Caracciolo G, Abe H, Wilansky S, Carerj S, Gentile F, Nesser HJ, Khandheria B, Narula J, Sengupta PP. Assessment of myocardial mechanics using speckle track¬ing echocardiography: fundamentals and clinical applica¬tions. J Am Soc Echocardiogr 2010 Apr;23:351-69. Artis NJ, Oxborough DL, Williams G, Pepper CB, Tan LB. Two-dimensional strain imaging: a new echocardiographic advance with research and clinical applications. Int J Cardiol 2008 Jan 24;123:240-8. Takano H, Isogai T, Aoki T, Wakao Y, Fujii Y. Feasibility of radial and circumferential strain analysis using 2D speckle tracking echocardiography in cats. J Vet Med Sci 2015 Feb; 77:193-201. Decloedt A, Verheyen T, Sys S, De Clercq D, van Loon G. Tissue Doppler imaging and 2-dimensional speckle tracking of left ventricular function in horses exposed to lasalocid. J Vet Intern Med 2012 Sep-Oct;26:1209-16. Anwar A, Nosir Y, Alasnag M, Llemit MA, Elhagoly AA, Chamsi-Pasha H. Quantification of left ventricular longi¬tudinal strain by two-dimensional speckle tracking: a comparison between expert and non-expert readers. Int J Cardiovasc Imaging 2013 Oct;29:1451-8. Decloedt A, Verheyen T, Sys S, De Clercq D, van Loon G. Two-dimensional speckle tracking for quantification of left ventricular circumferential and radial wall motion in horses. Equine Vet J 2013 Jan;45:47-55. Schefer KD, Bitschnau C, Weishaupt MA, Schwarzwald CC. Quantitative analysis of stress echocardiograms in healthy horses with 2-dimensional (2D) echocardiography, ana¬tomical M-mode, tissue Doppler imaging, and 2D speckle tracking. J Vet Intern Med 2010 Jul-Aug;24:918-31. Schwarzwald CC, Schober KE, Berli AS, Bonagura JD. Left ventricular radial and circumferential wall motion analysis in horses using strain, strain rate, and displacement by 2D speckle tracking. J Vet Intern Med 2009 Jul-Aug;23: 890-900. Berli AS, Jud Schefer R, Steininger K, Schwarzwald CC. The use of strain, strain rate, and displacement by 2D speckle tracking for assessment of systolic left ventricular function in goats: applicability and influence of general anesthesia. Cardiovasc Ultrasound 2015;13:11. Chetboul V, Serres F, Gouni V, Tissier R, Pouchelon JL. Radial strain and strain rate by two-dimensional speckle tracking echocardiography and the tissue velocity based technique in the dog. J Vet Cardiol 2007 Nov;9:69-81. Amory H, Lekeux P. Effects of growth on functional and morphological echocardiographic variables in Friesian calves. Vet Rec 1991 Apr 13;128:349-54. Teske AJ, De Boeck BW, Melman PG, Sieswerda GT, Doevendans PA, Cramer MJ. Echocardiographic quantifica¬tion of myocardial function using tissue deformation imaging, a guide to image acquisition and analysis using tissue Doppler and speckle tracking. Cardiovasc Ultrasound 2007;5:27. Chee HK, Tuzun E, Ferrari M, Conger JL, Stainback RF, Hernandez A, Bruno N, Shah NL, Tamez D, Eya K, Clark LL, Vaughn WK, Gregoric ID, Frazier OH, Kadipasaoglu KA. Baseline hemodynamic and echocardiographic indices in anesthetized calves. ASAIO J 2004 May-Jun;50:267-71. Hallowell GD, Potter TJ, Bowen IM. Methods and normal values for echocardiography in adult dairy cattle. J Vet Cardiol 2007 Nov;9:91-8. Amory H, Jakovljevic S, Lekeux P. Quantitative M-mode and two-dimensional echocardiography in calves. Vet Rec 1991 Jan 12;128:25-31. Buczinski S. Echocardiographic findings and clinical signs in dairy cows with primary cardiac lymphoma: 7 cases (2007-2010). J Am Vet Med Assoc 2012 Oct 15;241:1083-7. Boon JA. The M-mode and Doppler examination. In: Boon JA, editor. Veterinary Echocardiography. 2nd ed. Ames, IO: Wiley-Blackwell; 2011. p. 101-52. D'Hooge J, Konofagou E, Jamal F, Heimdal A, Barrios L, Bijnens B, Thoen J, Van de Werf F, Sutherland G, Suetens P. Two-dimensional ultrasonic strain rate meas¬urement of the human heart in vivo. IEEE Trans Ultrason Ferroelectr Freq Control 2002 Feb;49:281-6. Pavlopoulos H, Nihoyannopoulos P. Strain and strain rate deformation parameters: from tissue Doppler to 2D speckle tracking. Int J Cardiovasc Imaging 2008 Jun;24:479-91. Shapiro RS, Wagreich J, Parsons RB, Stancato-Pasik A, Yeh HC, Lao R. Tissue harmonic imaging sonography: evaluation of image quality compared with conventional sonography. AJR Am J Roentgenol 1998 Nov;171:1203-6. Weidemann F, Jamal F, Sutherland GR, Claus P, Kowalski M, Hatle L, De Scheerder I, Bijnens B, Rademakers FE. Myocardial function defined by strain rate and strain during alterations in inotropic states and heart rate. Am J Physiol Heart Circ Physiol 2002 Aug;283:H792-9. Suzuki R, Matsumoto H, Teshima T, Koyama H. Influence of heart rate on myocardial function using two-dimensional speckle-tracking echocardiography in healthy dogs. J Vet Cardiol 2013 Jun;15:139-46. Citro R, Galderisi M. Myocardial postsystolic motion in ischemic and not ischemic myocardium: the clinical value of tissue Doppler. Echocardiography 2005 Jul;22:525-32. Asanuma T, Nakatani S. Myocardial ischaemia and post¬systolic shortening. Heart 2015 Apr;101:509-16. Ozawa K, Funabashi N, Nishi T, Takahara M, Fujimoto Y, Kamata T, Kobayashi Y. Resting multilayer 2D speckle¬tracking TTE for detection of ischemic segments con¬firmed by invasive FFR part-2, using post-systolic-strain- index and time from aortic-valve-closure to regional peak longitudinal-strain. Int J Cardiol 2016 Aug;15:149-55. Koopman LP, Slorach C, Hui W, Manlhiot C, McCrindle BW, Friedberg MK, Jaeggi ET, Mertens L. Comparison between different speckle trackingand colortissue Doppler techniques to measure global and regional myocardial deformation in children. J Am Soc Echocardiogr 2010 Sep;23:919-28. Schwarzwald CC, Schober KE, Bonagura JD. Methods and reliability of echocardiographic assessment of left atrial size and mechanical function in horses. Am J Vet Res 2007 Jul;68:735-47. Buczinski S, Rezakhani A, Boerboom D. Heart disease in cattle: diagnosis, therapeutic approaches and prognosis. Vet J 2010 Jun;184:258-63. Zust J, Hrovatin B, Simundic B. Assessment of selenium and vitamin E deficiencies in dairy herds and clinical disease in calves. Vet Rec 1996 Oct 19;139:391-4. Kivrak T, Sunbul M, Cincin A, Kani T, Durmus E, Banzragch M, Bozbay M, Aydin Y, Imeryuz N, Sari I, Akin H, Basaran Y. Two-dimensional speckle tracking echo¬cardiography is useful in early detection of left ventricular impairment in patients with Crohn's disease. Eur Rev Med Pharmacol Sci 2016 Jul;20:3249-54. Udink ten Cate FE, Adelmann RO, Junker P, Hackenbroch M, Sreeram N. Screening children with sus¬pected myocarditis for global and regional myocardial dysfunction using two-dimensional speckle tracking echocardiography: is it of use? Int J Cardiol 2012 May 31;157: 278-81.